We warmly invite you to visit us here at YCF. We have two services on a Sunday at our Tooting Church; 9am-10.30am & 11am-1pm. In addition, we have a variety of services such as our monthly Healing and Deliverance service & our quarterly Community Engagement services. Please ring for further details. 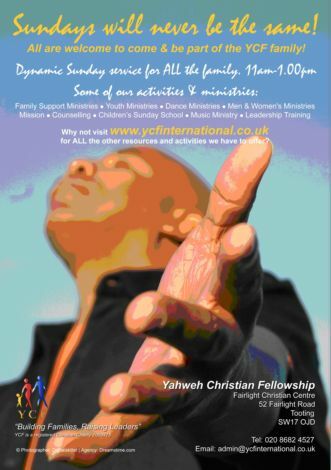 Impact Bible School 11am-12.30pm & 7.00pm – 9.00pm 1st, 3rd & 4th Wednesday of the month. Pastoral Care appointments Every Thursday. Appointment basis.